Hyperloop a transportation tube between major cities that can move passengers up to a speed of 800mph. Obviously, this kind of transportation system would be much faster than cars and trains, and Musk proposed a ticket would be cheaper than a standard plane ticket. The problem with the Hyperloop, though, is that in order for it to be convenient on a widespread basis, the country would need to be littered with loopways looming above ground, with many branches and local stations. Though much slower, cars are more convenient than a single line of transportation with limited stops, because cars go wherever roads go. That, however, is still limiting since roads don’t always follow an optimal path. A personal flying device would be the ultimate mode of unhindered transit. Now, with this new flight permit, Marin Aircraft Company can finally put the finishing touches on its Martin Jetpack, and prep it for a consumer release. The jetpack is a simple construction relative to what you might think a jetpack would be composed of, yet it still functions like the jetpack in your imagination. Rather than anti-grav science fiction technology, the Martin jetpack is composed of two cylinders with large propulsion fans that flank the central seating area. The frame is made of carbon-fiber, and it employs a rocket-propelled parachute. Building a jetpack isn’t as easy as slapping two huge fans onto chair sounds, though. Martin dedicated a significant amount of time tweaking the build, such as the precise position of the jetpack ducts. The personal vehicle uses a V4 piston engine, can reach a top speed of 63mph, carries around five gallons of gasoline, and its range is limited to around 32 miles. So, that’s about a half hour of flight time. A previous successful, humanless jetpack flight test managed a height of 5,000 feet, but it was only inhabited by a dummy pilot. While an experimental flight permit is a great news, the team is restricted to a height of 20 feet over ground and 25 feet over water with a human pilot. Still, that’s much better than never knowing how the device performs with a human pilot. Regardless, Martin states these tests will lead to a jetpack designed for emergency use (military, medical, etc.) to release sometime in the middle of next year. 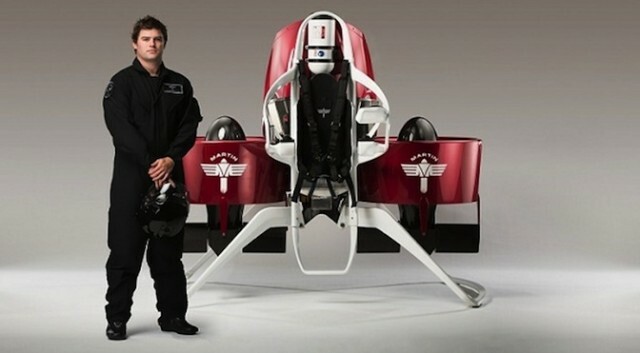 As exciting as jetpack paramedics may be, Martin estimates that it will release a general consumer model jetpack in 2015. Sadly, it will initially cost around $200,000, though the company expects the price to drop quickly as time rolls along. If you have that kind of cash lying around or want to live in the future already, you can keep up-to-date with all your consumer jetpack news over on Martin’s website.